Utah is 5-1 on the road and 2-3 at home in Pac-12 basketball. Red All Over is a weekly newsletter covering University of Utah athletics. Subscribe here. Utah coach Larry Krystkowiak was ready with an answer, when questioned about why the Utes haven’t played their best basketball at the Huntsman Center. He's taking his team on the road this weekend. The Utes will spend Friday night at a hotel, between Thursday’s game vs. Arizona and Saturday’s contest vs. Arizona State. Major college football teams typically stay at a hotel before home games, but this is an unusual move in basketball. Will it help? The Utes started poorly against Oregon State on Feb. 2, the last time they concluded a two-game homestand. 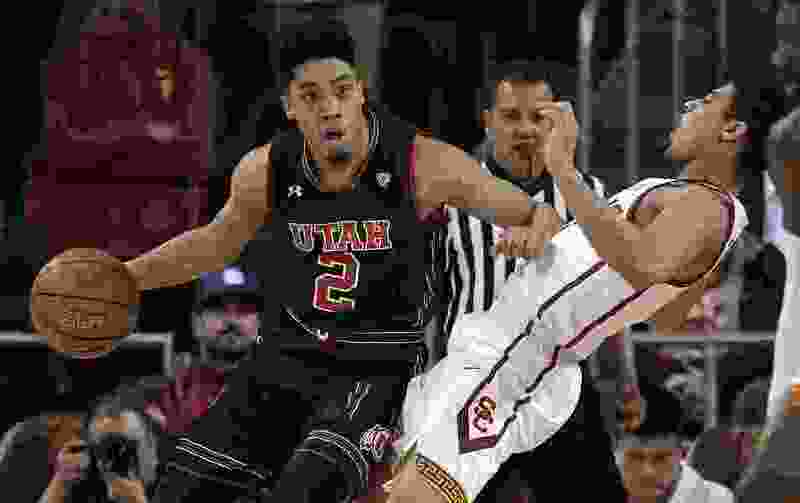 And they’ve played well in all six of their Pac-12 road games, although they lost at Arizona in overtime and trailed UCLA by 22 points before coming to life in a 93-92 victory last Saturday. Utah is 5-1 on the road and 2-3 at home in Pac-12 play. The Utes are the extreme case of a Pac-12 trend. Road teams are 31-38 (.449) in conference play, challenging the all-time high of .484, set in 2007-08 in the Pac-10 era. The Utes have four home games remaining, against Arizona and three teams they beat on the road: Arizona State, USC and UCLA. Thanks to Colorado’s win over ASU on Wednesday, Utah (7-4) is tied with Oregon State for second place and Arizona (5-6) is alone in 10th place. That’s crazy. Dirk Facer of the Deseret News chronicled Ute center Jayce Johnson’s upward trend (DNEWS). • The Ute lacrosse team claimed the program’s first victory, defeating Mercer 13-9 last Saturday at Judge Memorial’s McCarthey Stadium, as Alpine product Josh Stout scored seven goals. With 10 goals in two games, Stout is tied for third in the country. The Utes (1-1) will play four road games over the next three weekends, beginning Saturday at Hofstra in Hempstead, N.Y. Hofstra opened the season with a 4-3 upset of then-No. 13 Lehigh. • Utah’s softball team went 4-1 in Arizona State’s season-opening event. The Utes will play five games this weekend at Clearwater, Fla., facing four ranked opponents on Friday and Saturday: No. 18 Kentucky, No. 17 Oklahoma State, No. 23 Ohio State and No. 6 Tennessee. Utah will meet Hofstra on Sunday. Julia Nofskin went 8 of 19 (.421) at the plate for Utah last weekend. • At Washington’s indoor track and field field meet, Utah’s Sarah Feeny broke the school record in the 3,000 meters by running 9 minutes, 11.46 seconds. Fenny finished 14th. Jackson and Cody Barton played together as Utah seniors. The dual launch of their NFL careers is next. Donovan Mitchell went on the attack against the Rockets in Game 4 and Houston couldn’t stop him. A harbinger for Game 5?